An open window is an ideal that people often take too literally. While we see characters in movies and fairy tales leaving windows open for their princes or dreams to come, the same cannot be done in real life. An open window is an invitation to a lot of evils that can cause serious bodily harm. I wanted to have the benefits of an open window without having to incur these liabilities, so I chose to install window screens on my window. Although ventilation can now be provided by home appliances such as electric fans or air conditioning units, there’s still something different about a breeze brought about by an open window. However, other unwanted objects may also be blown in such as dirt, dust, unknown particles and even loose leaves. What’s worse is that an open window is also an open invitation to small animals and even robbers. As such, window screens provide the perfect alternative to a directly open window. It acts as a filter which lets the air in while preventing other unwanted matter from doing so. Also, since the screen is made from small woven wires, the view of the outside is still discernible. I love how having a screen for you window gets you the best of both worlds without any of the disadvantages. Another good thing about window screens is that they look good from almost any angle. I feared before that installing a window screen would make my house look less elegant. Oh, how wrong I was indeed. Just like normal windows, screens, when complemented with the proper window treatments such as window blinds or roman shades, will still look magazine-worthy. Being effective, however, does not come without a price. Because of being able to filter almost anything that rides on the wind, window screens often accumulate dirt and dust. As such, it is necessary to clean your window screens for about twice to four times a month. Leaving it by itself would be similar to getting a stronger dose of that which you avoid by installing the screens in the first place. A word of advice to the wise: try going for sliding window screens. Normal screens are fixed on the window and serve a more or less permanent period. Sliding screens allow for easy access to an open window when such a need arises for it. Cleaning the screen is also easier because one can dismantle the sliding screen from the inside easily and thoroughly clean it with soap and scrub, unlike the fixed window screens that require unscrewing for a thorough clean. 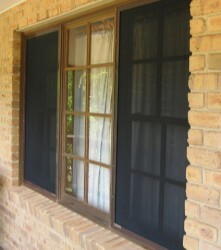 Try looking up sliding screen window sets online and experience a significant change in your lifestyle.